Notes: Denominators used to calculate percentages for adult day services centers, nursing homes, and residential care communities were the number of current participants enrolled in adult day services centers, the number of current residents in nursing homes, and the number of current residents in residential care communities in 2014, respectively. 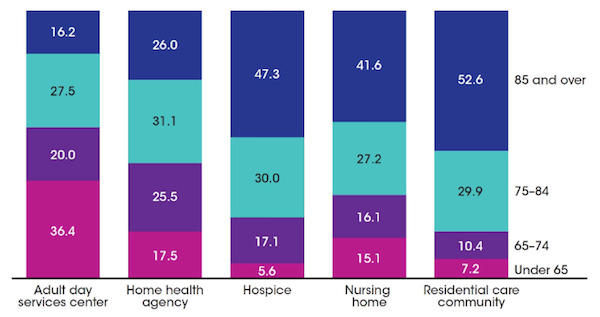 Denominators used to calculate percentages for home health agencies and hospices were the number of patients who received care from Medicare-certified home health agencies at any time in 2013 and the number of patients who received care from Medicare-certified hospices at any time in 2013, respectively. See Technical Notes for more information on the data sources used for each sector. Percentages may not add to 100 because of rounding. Percentages are based on the unrounded numbers. Data Source: CDC/NCHS, National Study of Long-Term Care Providers and Table 4 in Appendix B. This entry was posted in Medicine and Society Data Watch on March 2, 2016 by Genevra Pittman.